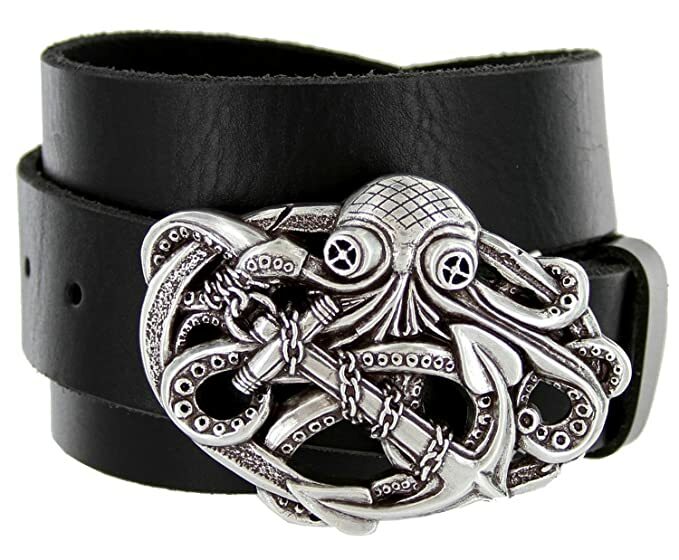 Ahoy Thar Mateys! 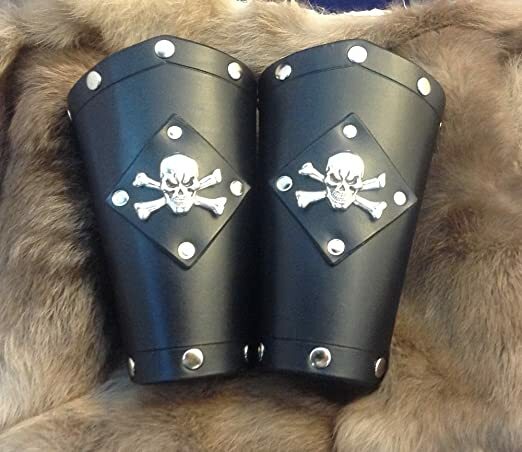 Men’s leather pirate accessories are an asset to creating an authentic looking pirate costume. 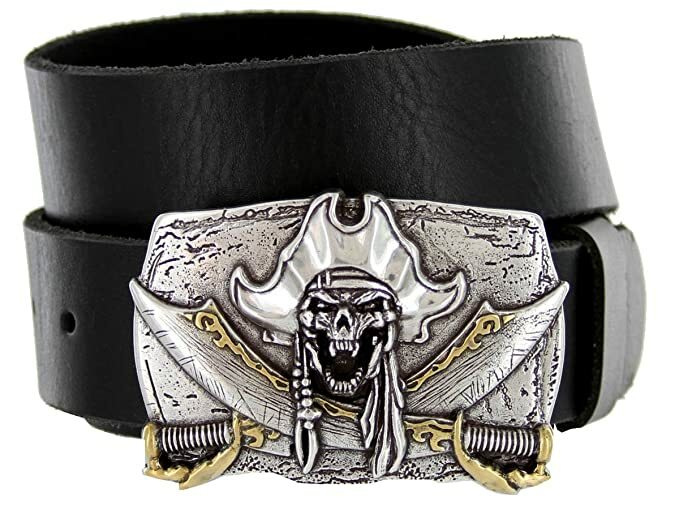 Here at DeluxeAdultCostumes.com be a fine collection of men’s leather pirate accessories of the finest quality, genuine leather fit for any buccaneer worth his salt at sea. 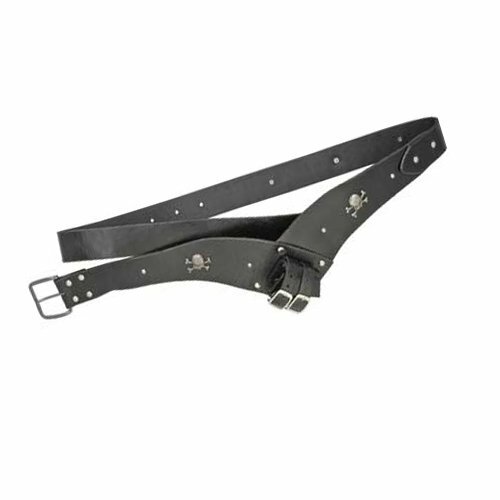 We are featuring leather pirate waist belts with pirate buckles, leather sword baltic belts, leather knife sword and knife holsters, leather pirate wristbands, leather belt drinking accessories, and leather coin pouches. 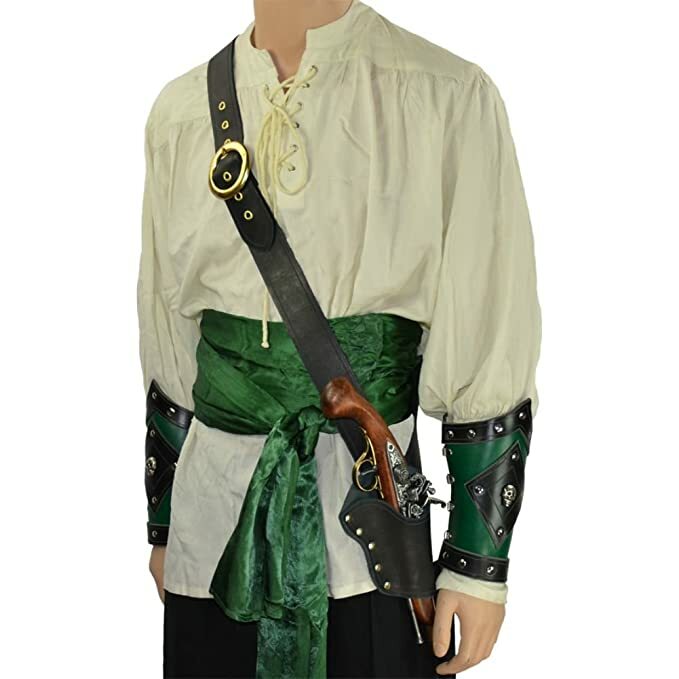 Adding pirate accessories to your original semi-homemade pirate costume will take your costume from ordinary to extraordinary. 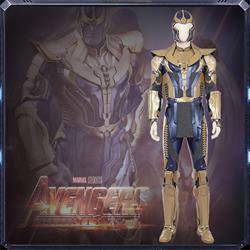 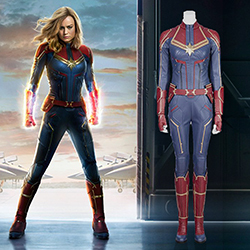 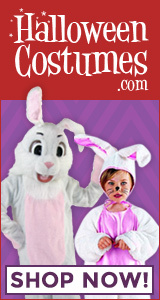 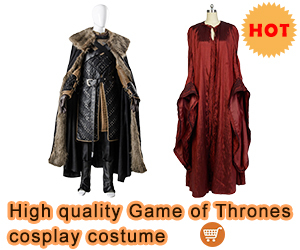 Your costume will be as historically correct as possible in this modern day and age of synthetic fabrics and materials. 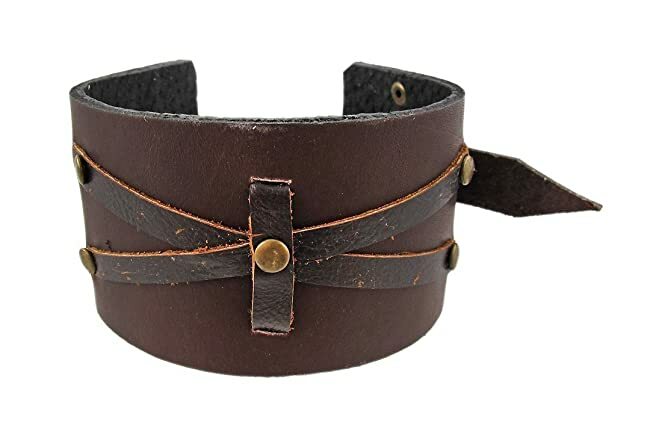 During the Golden Age of Piracy during the late 17th and up to the mid-18th centuries, men used their belts to carry all manner of leather pirate accessories such as weapons, coin pouches, and drinking cup straps. 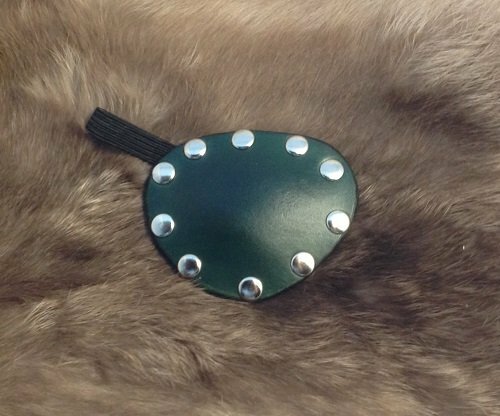 Often they wore several belts order to carry all their accessories. 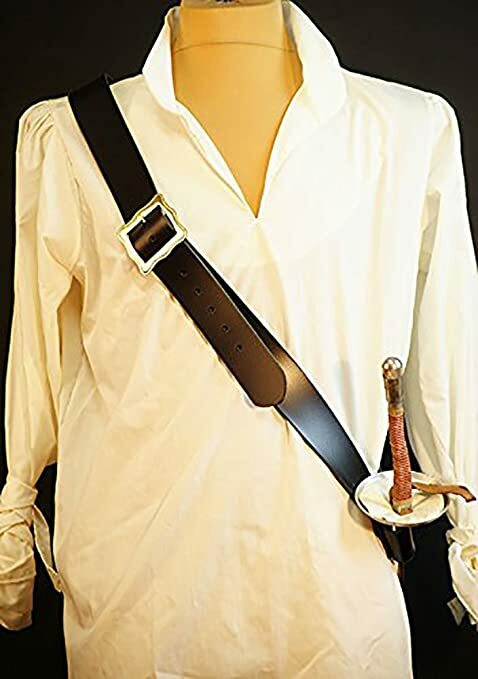 Wearing a Jolly Roger belt is a really fun accesssory for a pirate costume. 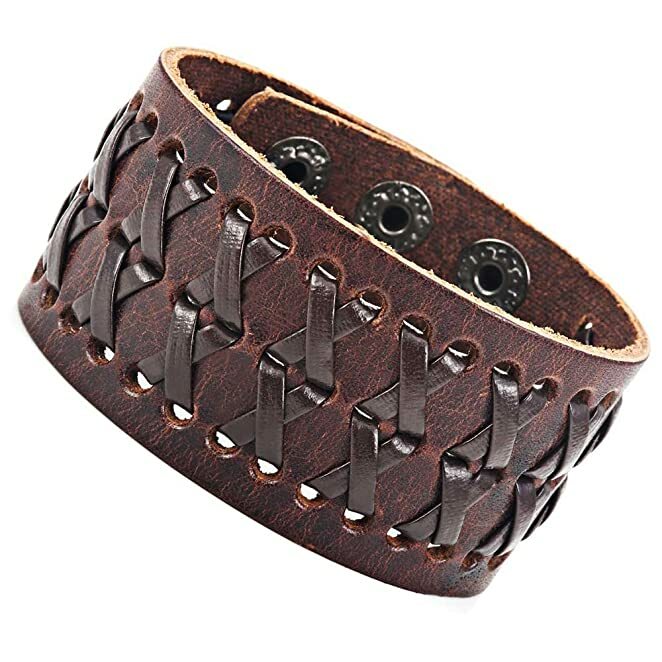 The leather belt is just the right width to hang other leather accessories, but as you know pirates are known for wearing several waist belts to hold all of their weapons and accessories, and this is a great start for a decorative piece. 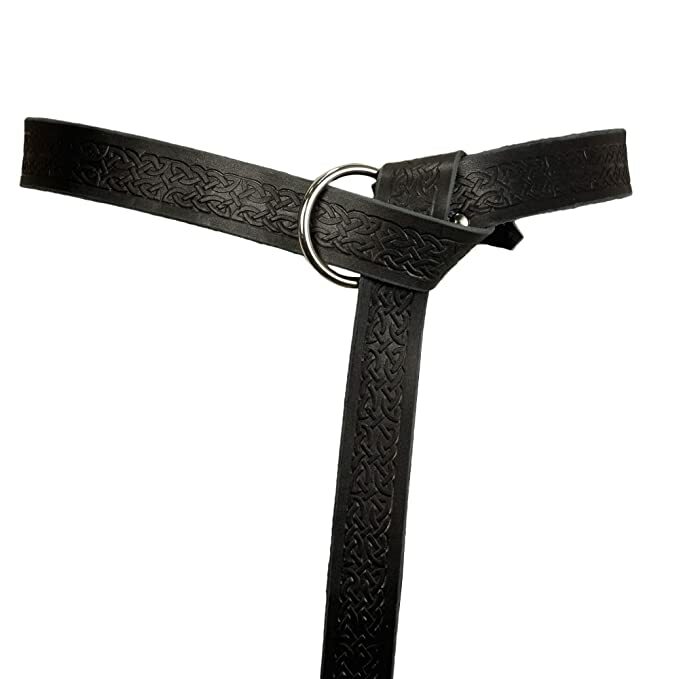 For a second belt I would look for either a plain o-ring belt, which was popular in the 16th and 17th century or a belt with an traditional ornate buckle..
An ornately designed cross belt buckle, such as this one, would have been worn by a Roman or Spanish nobleman in the 16th or 17th-century. 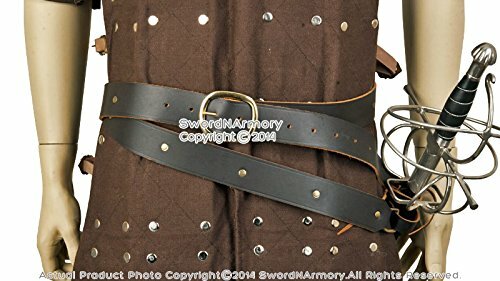 A pirate would have pillaged it from a religious Roman Catholic noblemen on a ship overcome by pirates and worn it proudly as a portion of booty he had well earned. 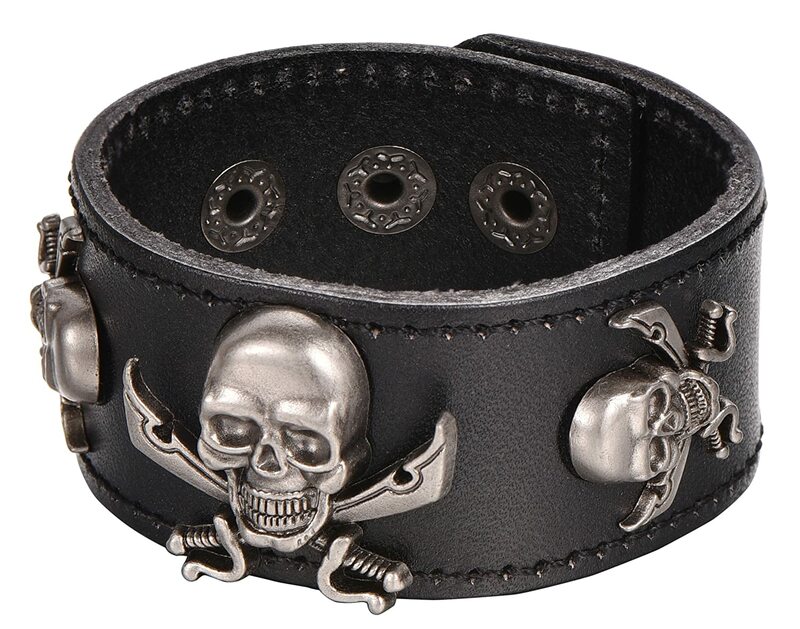 It will make a great accent piece to any pirate costume. 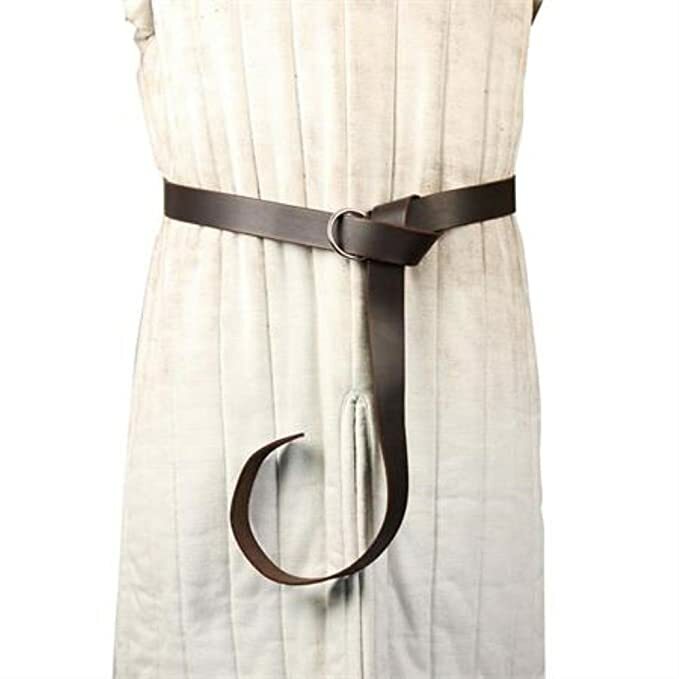 Typical of the belts worn by both land lubbers and sailers during the Medieval and Renaissance eras. 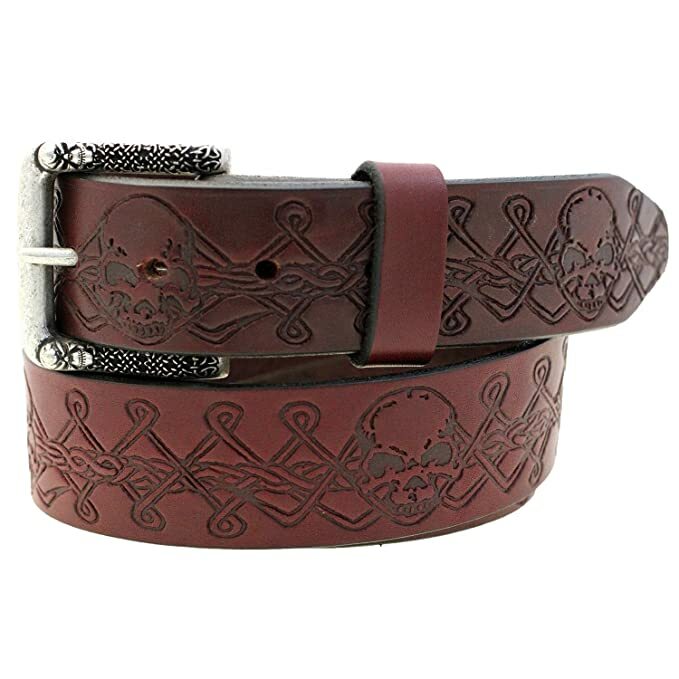 Lower class “working” men and merchants worn plain leather belts while the noblemen wore much more decorative, hand tooled belts with ornate metal belt buckles. 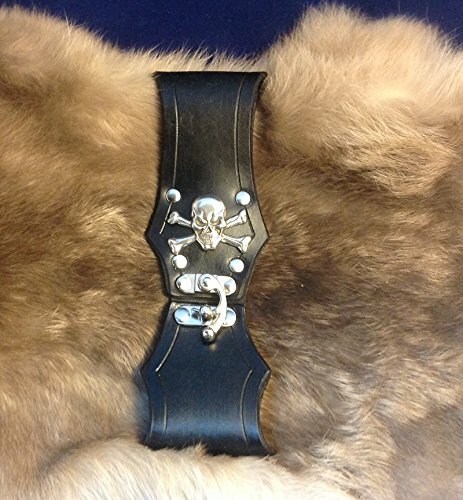 Pirates wore the belts they were able to pilfer in their line of “work” and the more elaborate the better. 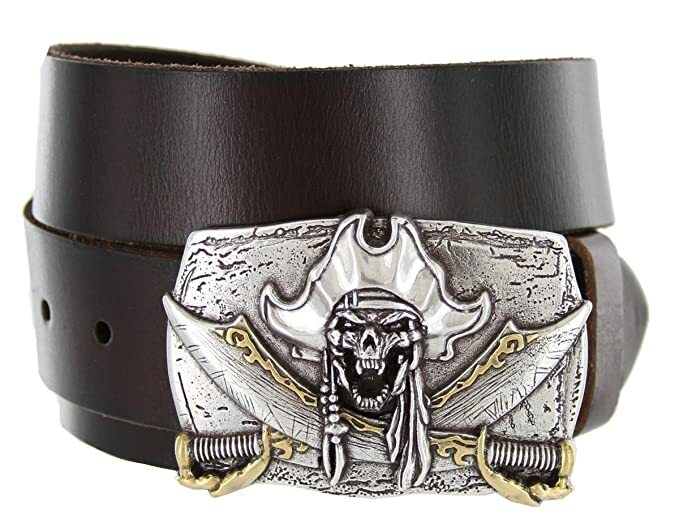 Although this Jack Sparrow belt set is an inexpensive, obviously faux leather set, the metal Renaissance style belt buckles do look awesome. 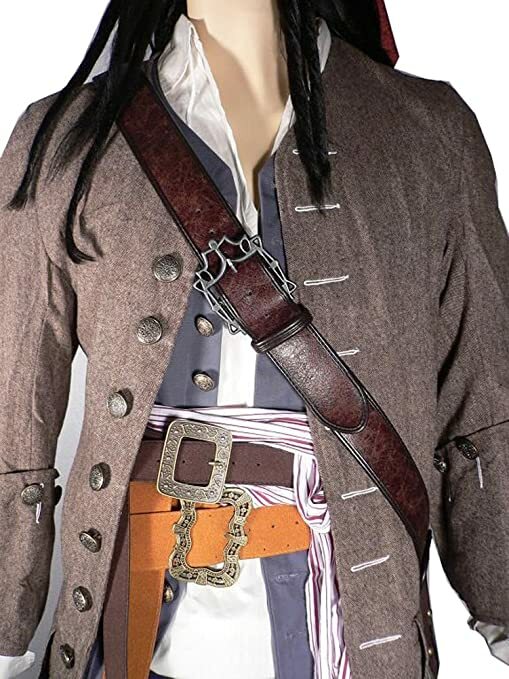 This Jack Sparrow belt prop set is for the budget concious costumer. 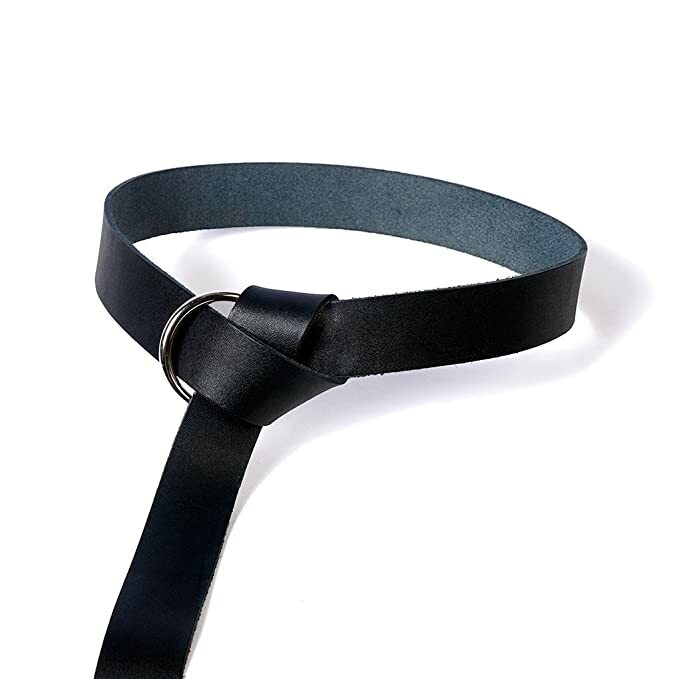 Don’t expect the belts to last, but the metal buckles could always be saved and used on genuine leather belts after the faux leather wears out. 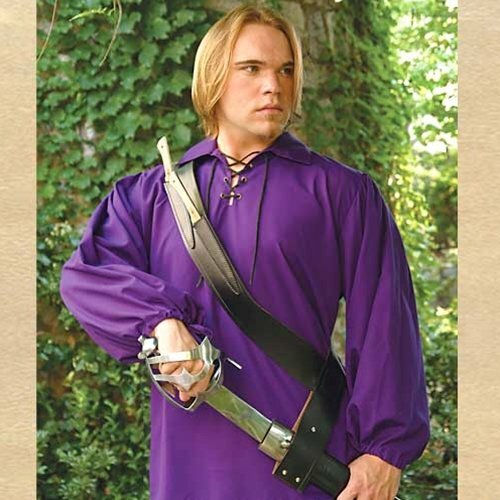 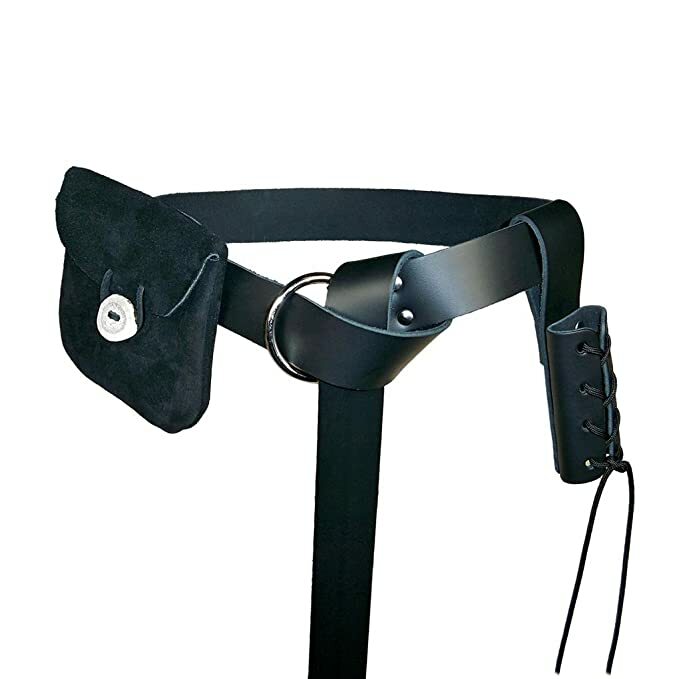 The baldric shoulder belt may be purchased separately below. 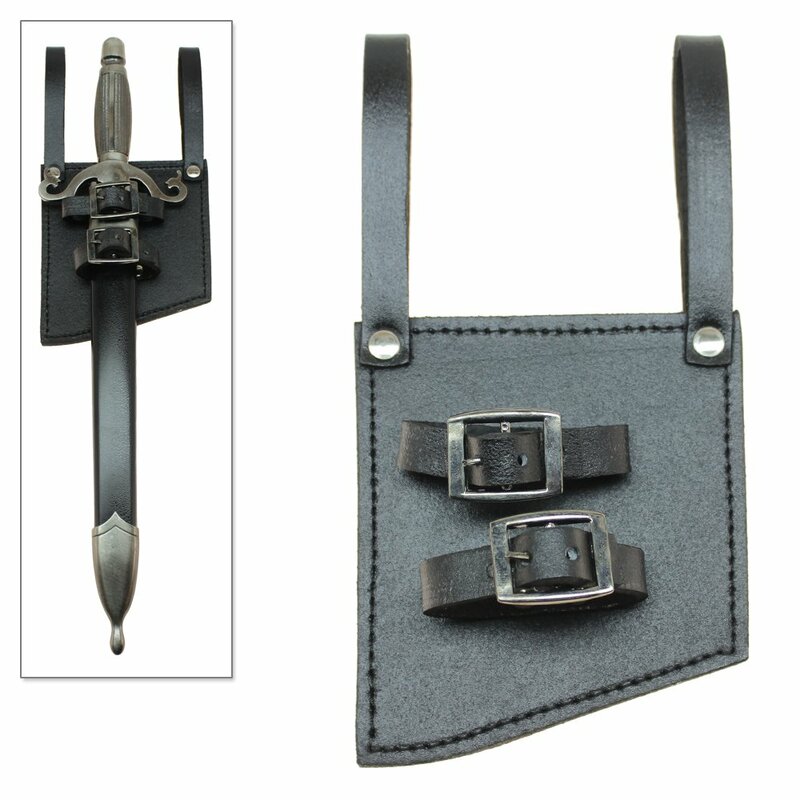 A tough high-quality black leather baldric fastened with brass rivets and brass buckles. 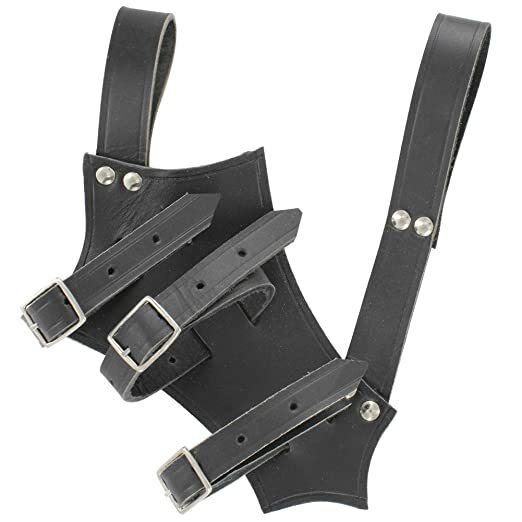 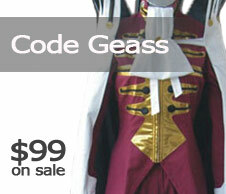 It comes with adjustable scabbard and adjustable belt buckle shoulder straps. 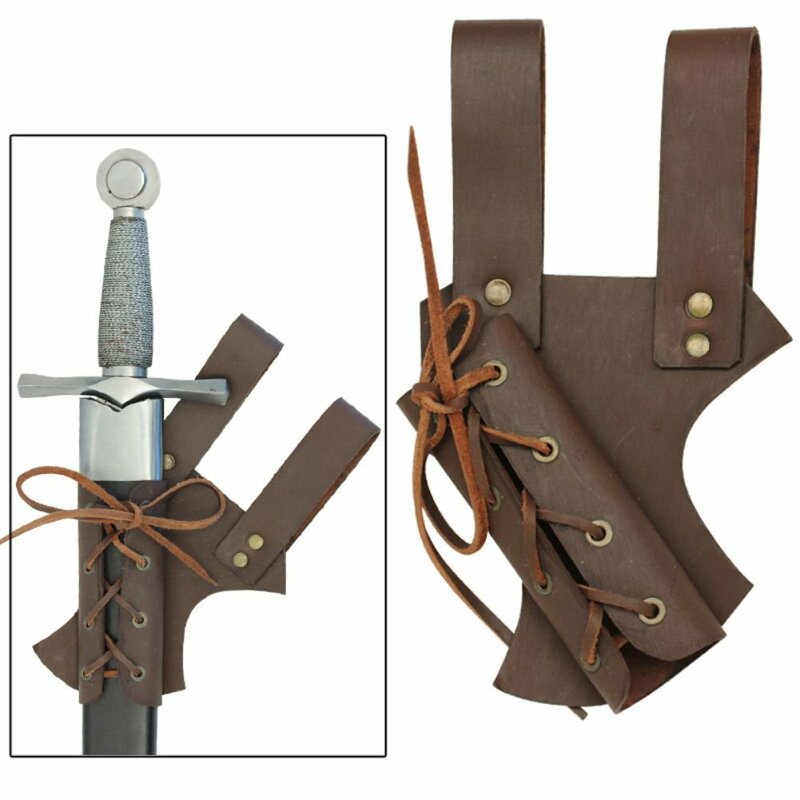 This baldric is specifically designed to house a long sword or claymore, but fits most Medieval style swords. 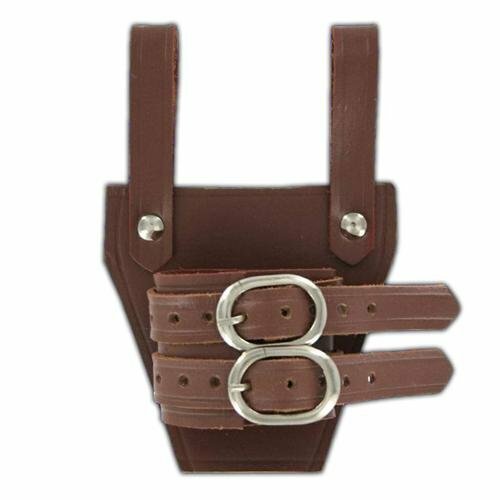 Commonly refered to a back hanger baldric, this baldric is crafted from tough high-quality leather dyed brown and fastened with steel rivets and buckles. 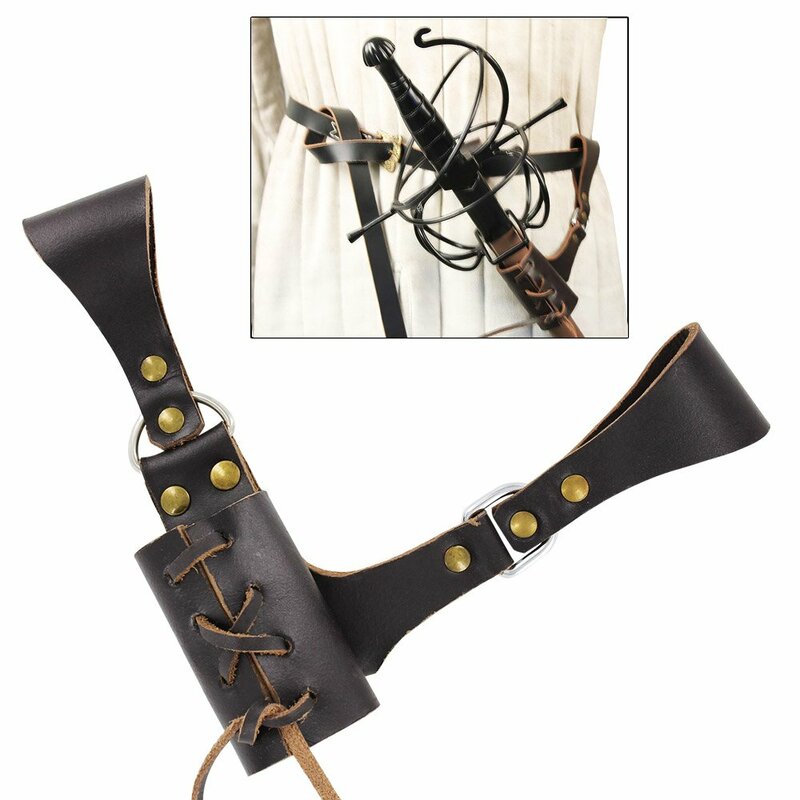 Crafted to accommodated long swords or claymores, but can be adjusted with the buckles to fit any sword length. 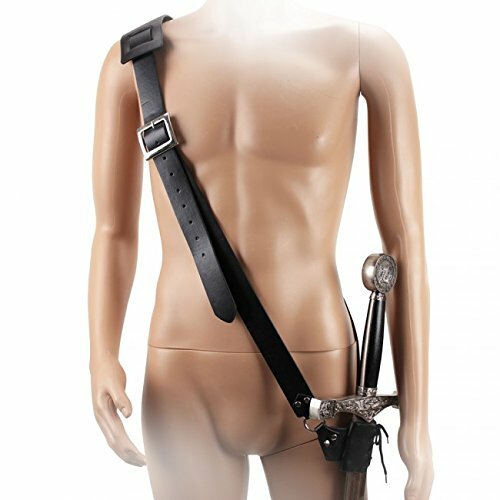 A Jack Sparrow, faux leather, baldric sword belt only. 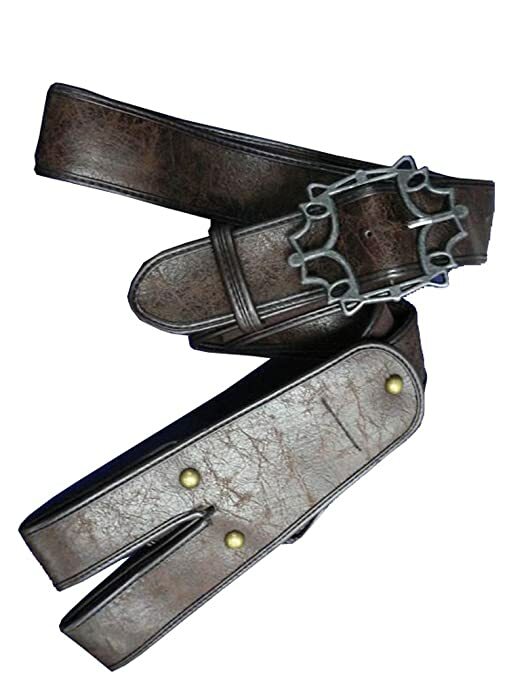 This shoulder belt does not included the two waist belts featured above in the Jack Sparrow belt set. 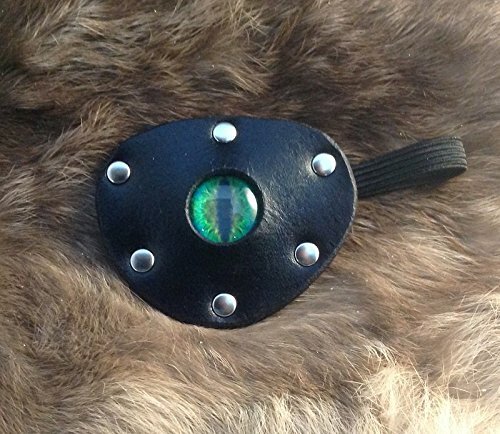 I think the belt buckle on this baldric belt is pretty cool looking. 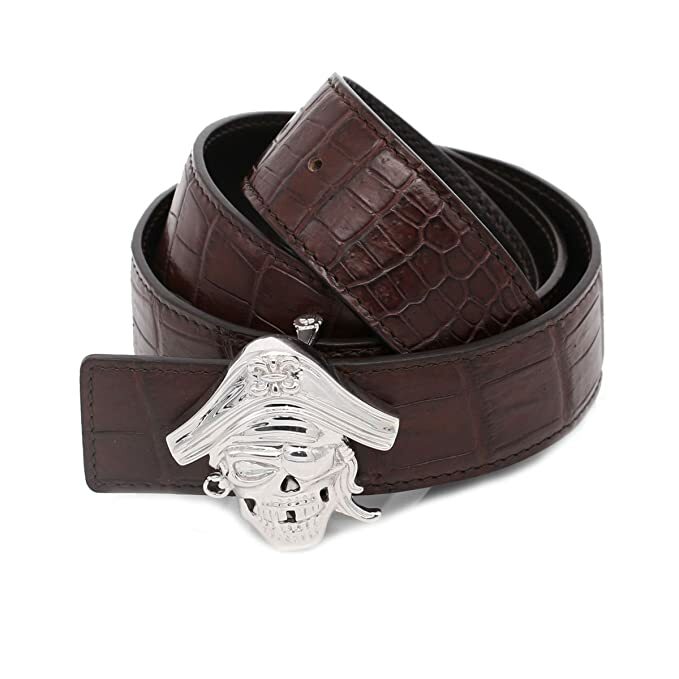 It isn’t easy finding belt buckles with this antique design any more. 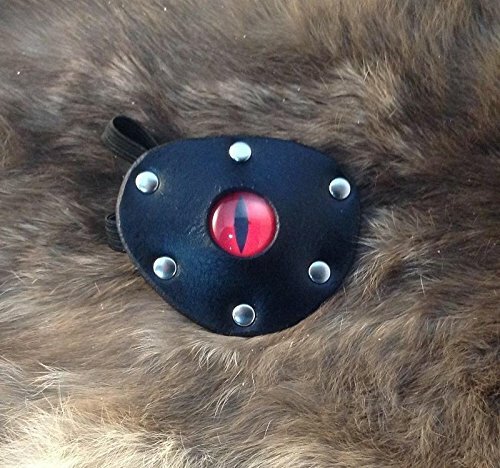 I always have my eye out for these types of antique belt buckles at estate sales, garage sales, and flea markets to use with our costume wardrobes. 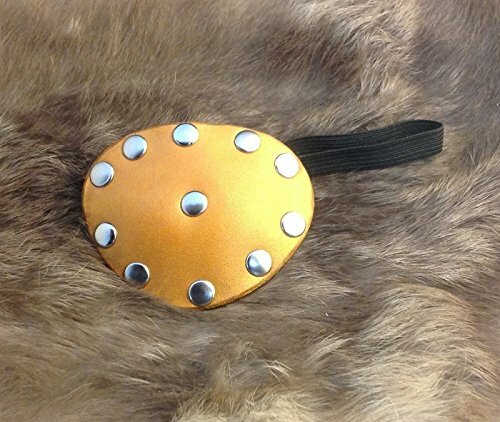 Leather baldrics created by Armor Venue to carry pistols or blunderbusses. 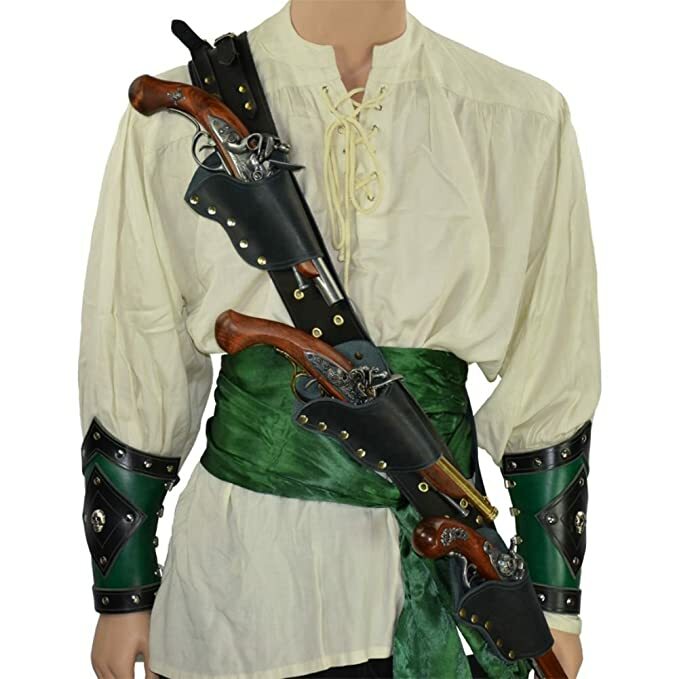 These baldrics fully loaded are excellent pieces to complete the look of a Captain Charles Vain, Blackbeard, Captain Flint, or any other pirate buccaneer sailing the seven seas. 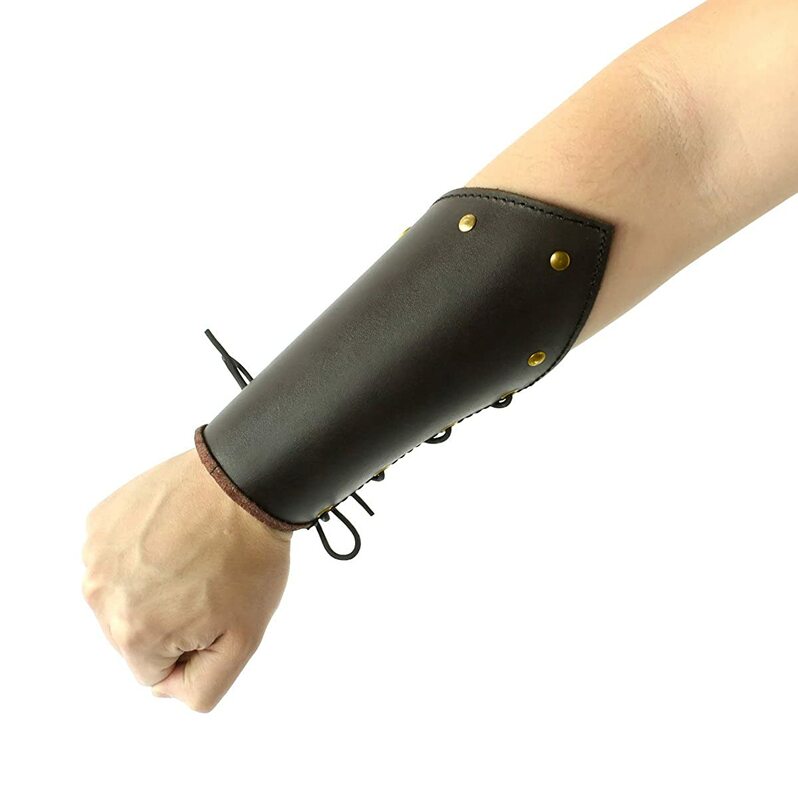 They are fabulous well made high-quality leather costume props perfect to use at LARP events, historical reenactments, cosplay events, Halloween or Mardi Gras parades and balls, Pirate Fest and Pyrate Cons, theatrical props, and Renaissance Faires. 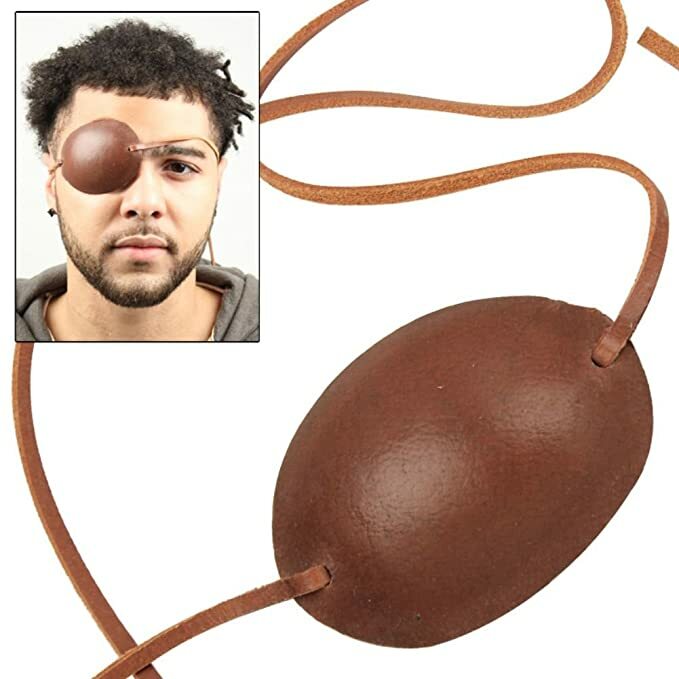 Avast thar matey! 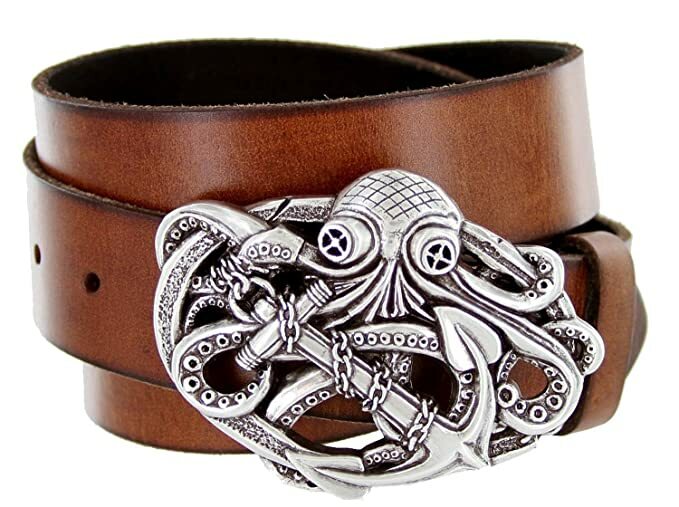 Jump aboard ye yonder merchant ship armed with cutlass in hand and secure ye bountiful booty found aboard for ye ships captain! 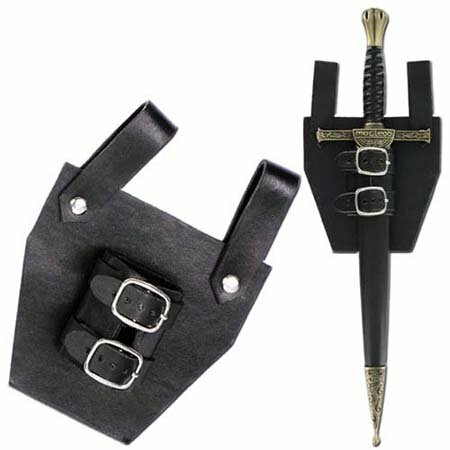 Included with this set is a classic black leather cutlass sword baldric belt with two polished bone scale handled close quarter fighting knives sheathed in the scabbards. 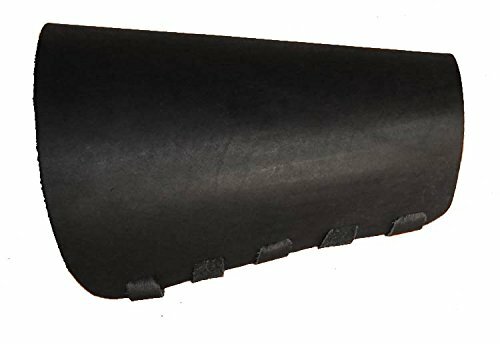 The knives are crafted from tempered high carbon steel. 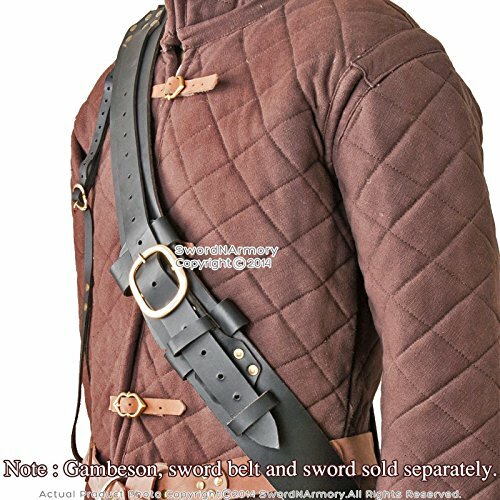 Right-handed blokes will cross draw the knives from the front scabbards, and left-handed blokes will cross draw the knives from the scabbards on the back. 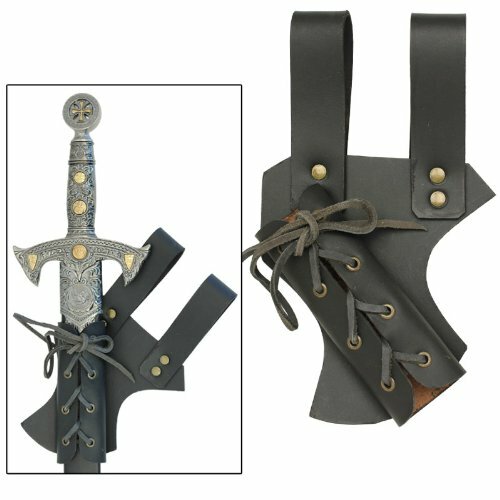 This black baldric is left unfinished, unstitched, and unriveted to accommodate all types of swords for all types of swordsmen. 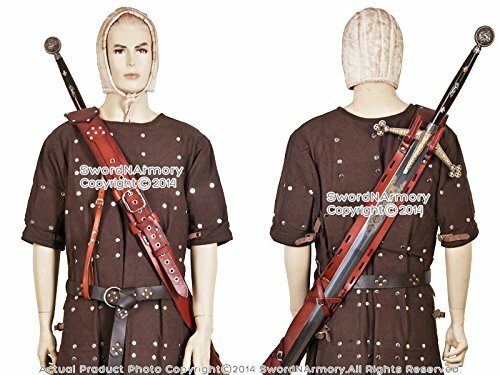 This baldric set is a really great value for the money! 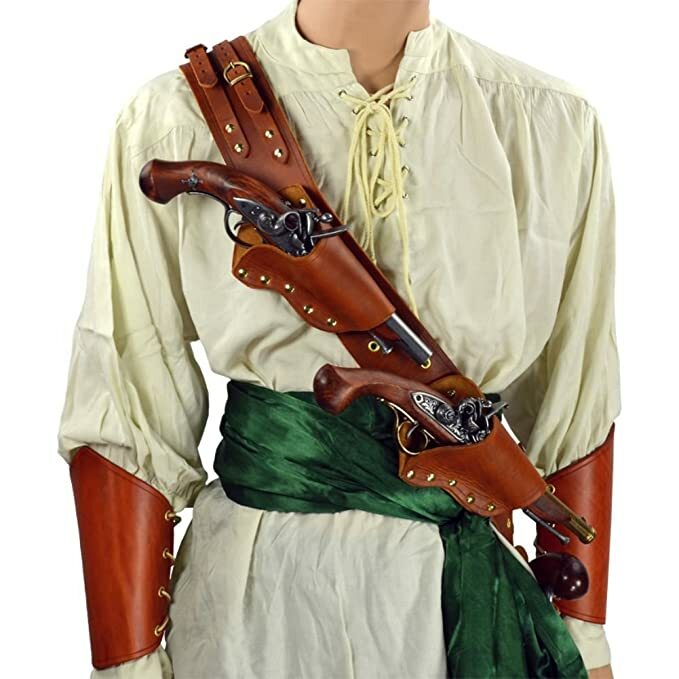 Often pirates and sailors from the Renaissance era wore pirate’s breeches, trewes, and slop pants which did not come equiped with pockets. 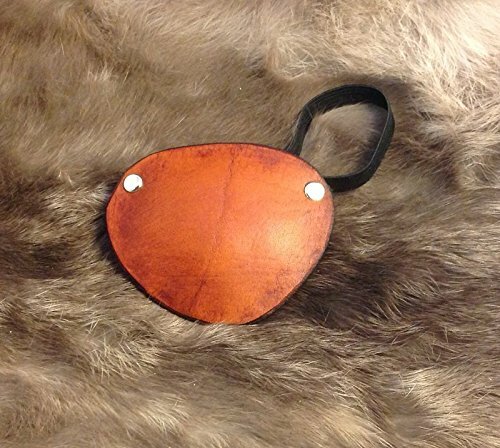 Instead, they carried their coinage in leather pouches, bags and purses they wore attached to their leather belts like the ones we featured above. 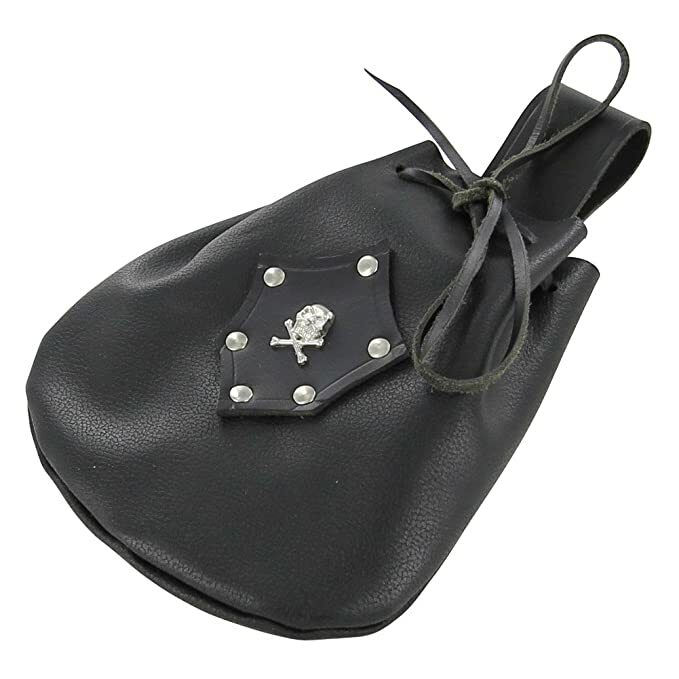 A fabulous black leather accessory, handmade coin purse with silver-tone rivets and skull and crossbones embellishment. 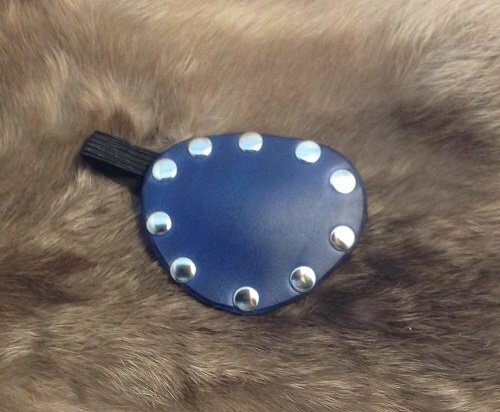 Hang a pouch from your belt and use it to hold credit cards, cell phones, driver’s license, and keys when attending a summer festival. 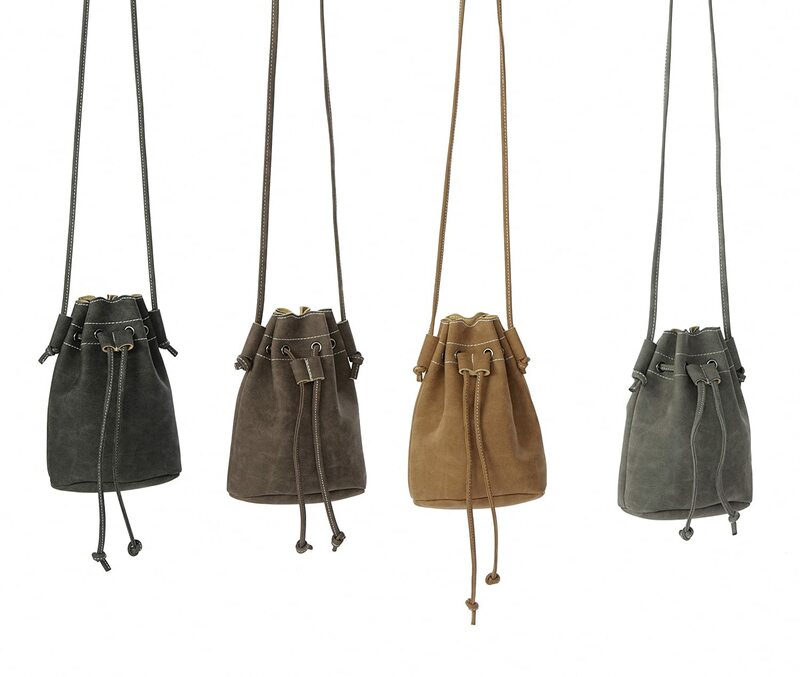 These large faux suede pouches will hold all the necessities while blending right in with your pirate costume. 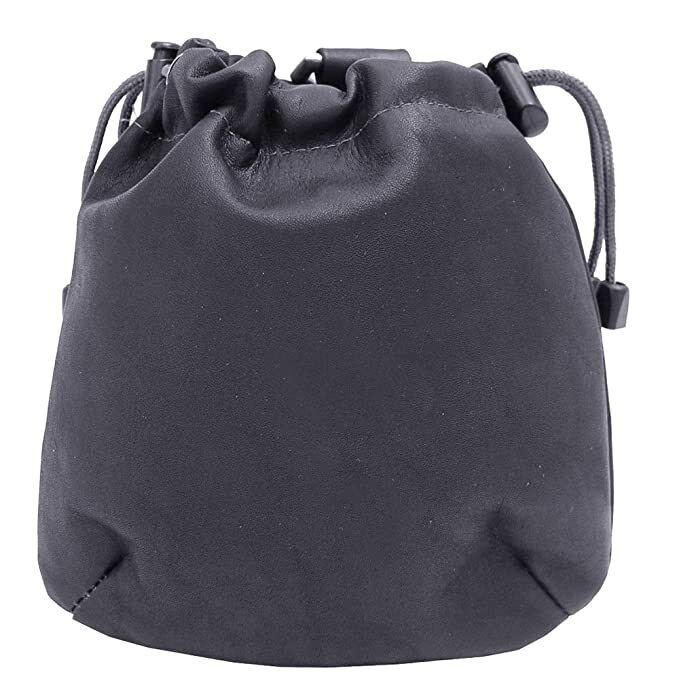 Personally, I prefer genuine leather for lasting durablity, but these faux suede coin purse bags will satisfy the look for all of the vegan costumers. 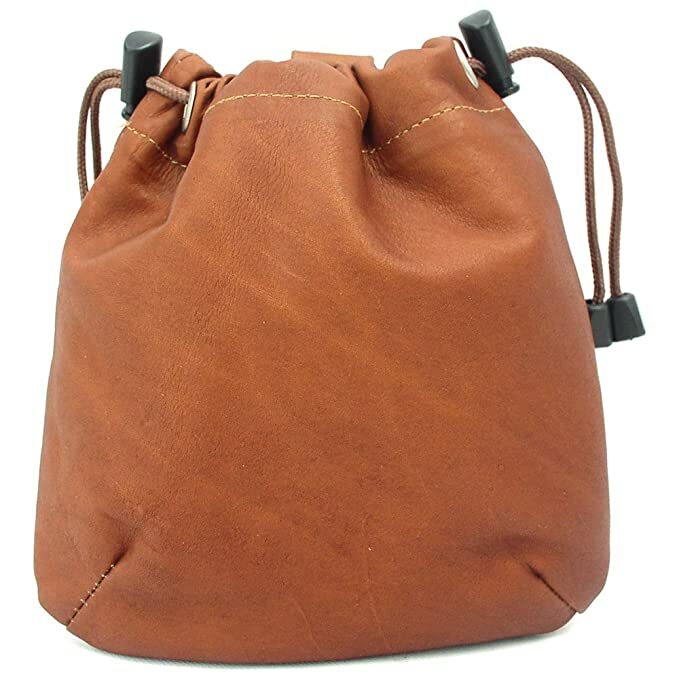 Roomy, genuine leather, drawstring pouches to hang from your belt, pirate sash, or baldric. 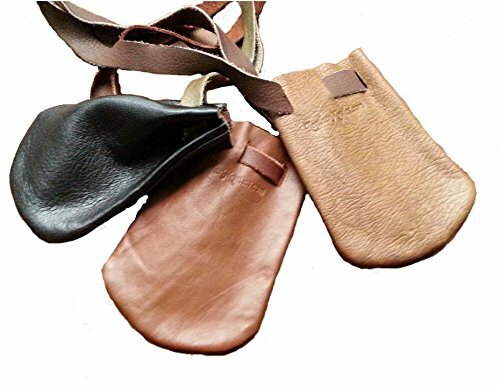 These pouches are handcrafted in Colombia from high-quality, genuine tanned leather, using high-quality leather dye. 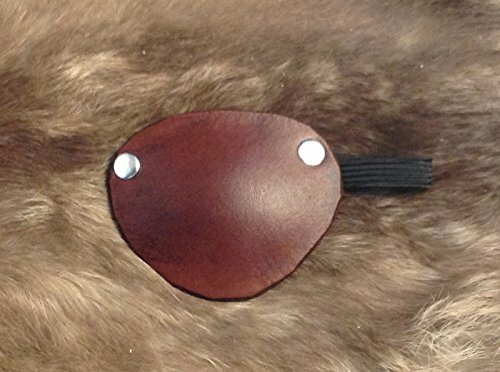 I recommend working in saddle soap when you first get it to soften it up a bit and to remove excess dye to achieve a more weathered look. 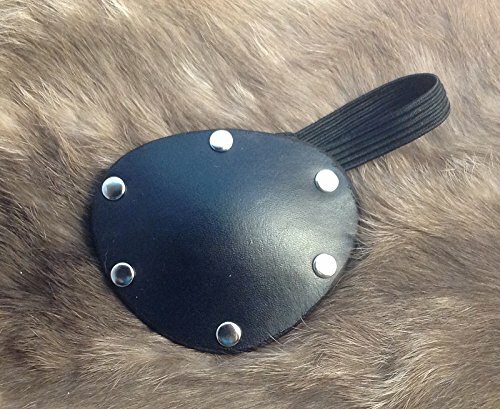 Once it is dry from the saddle soap. 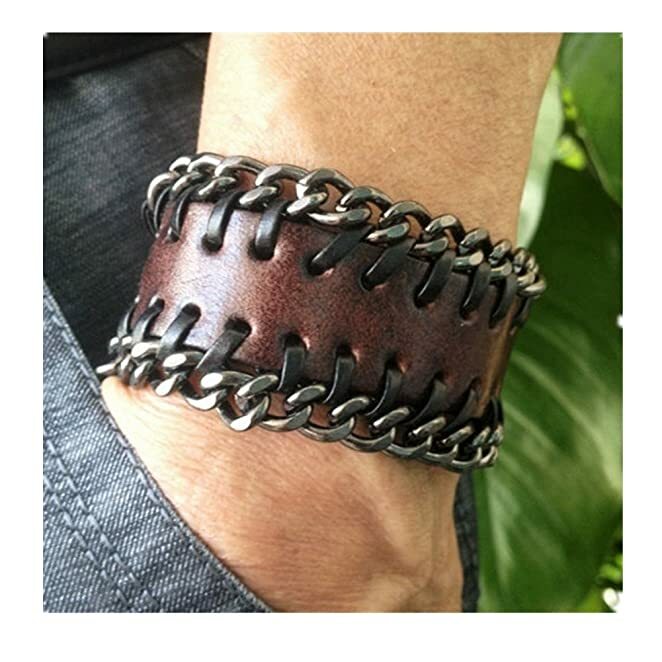 Work in some leather conditioner to both soften and protect the leather. 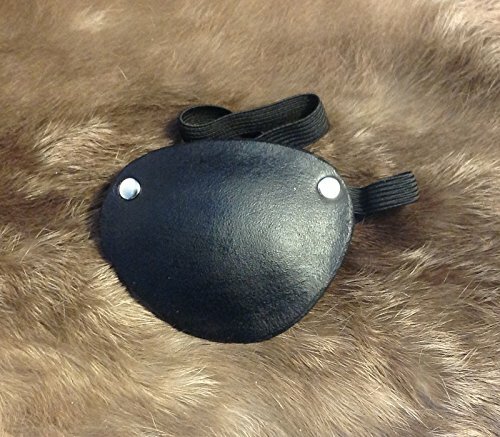 A great looking black genuine leather and suede belt pouch which can be used for many different purposes and eras in history. 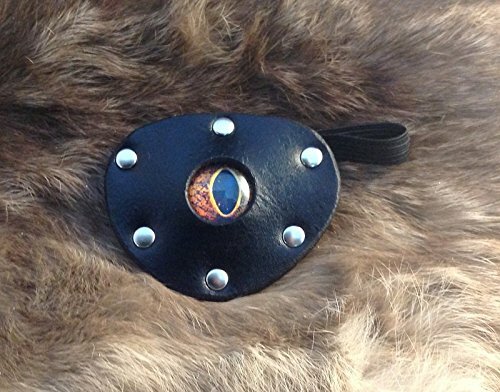 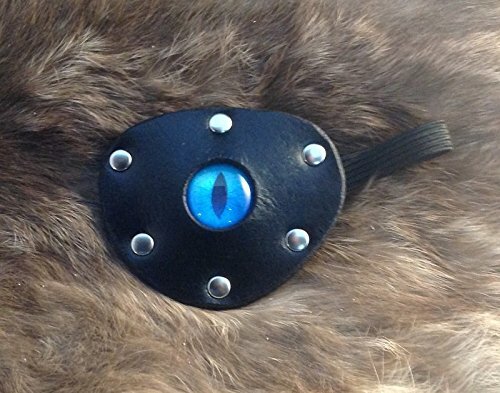 Use it as a money pouch, a dice bag, or tobacco pouch, it is entirely up to you. 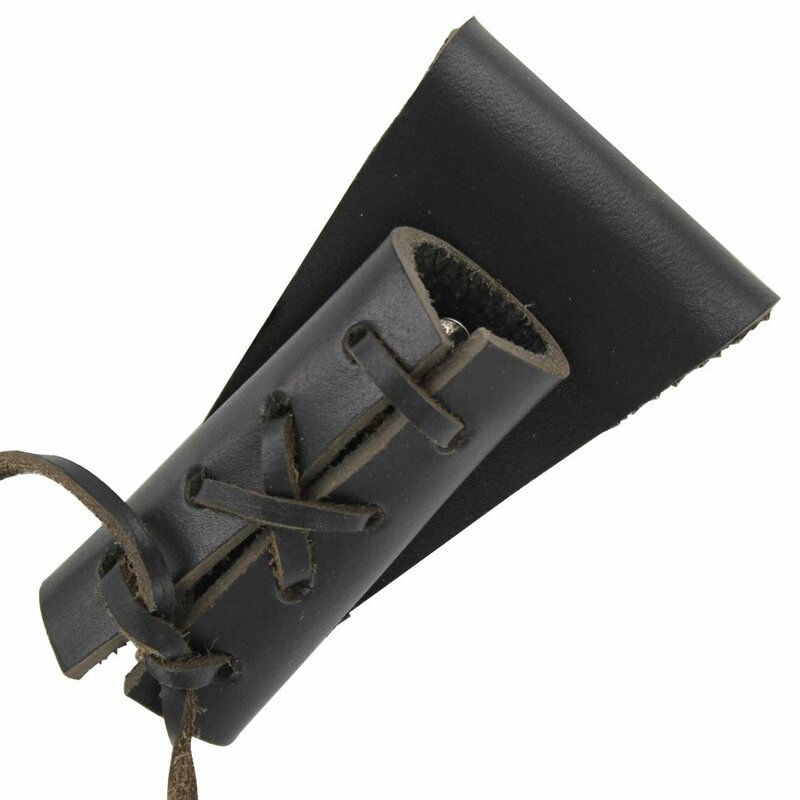 Whether playing the part of a pirate at sea, a peasant during the Renaissance, or a colonial gentleman, you will get a lot of costume uses from this black peasant pouch. 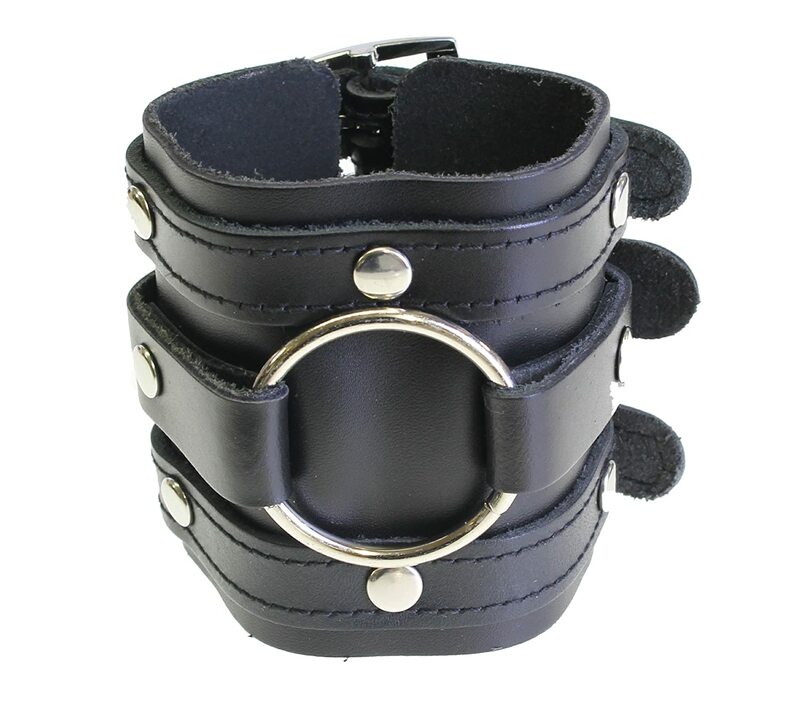 It has adjustable leather string closure and belt loops to slide over your leather belt. 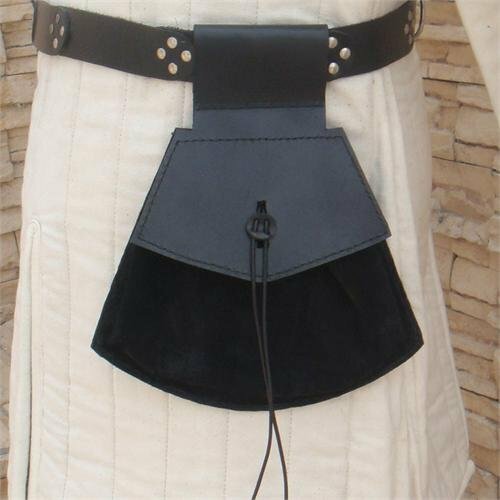 Click here to see more Men’s Medieval Renaissance pouches, bags and satchels. 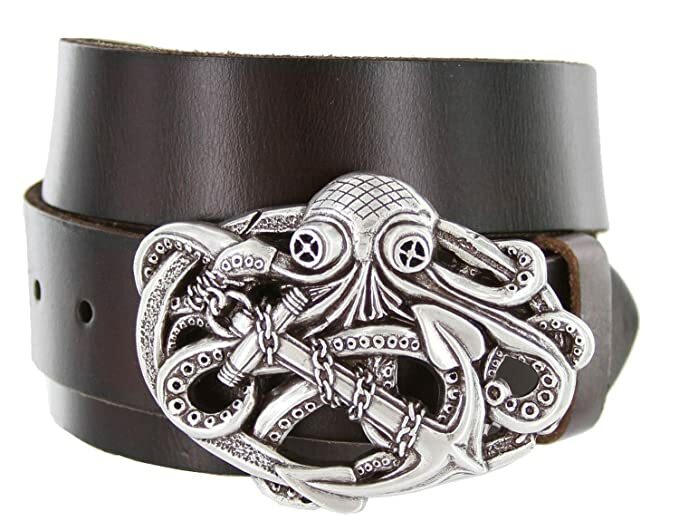 Avast thar me laddie! 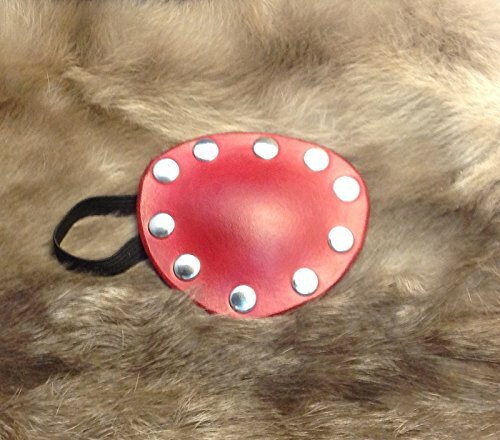 Be ye interested in tryin’ yer luck out by playin’ a wee game o’chance? 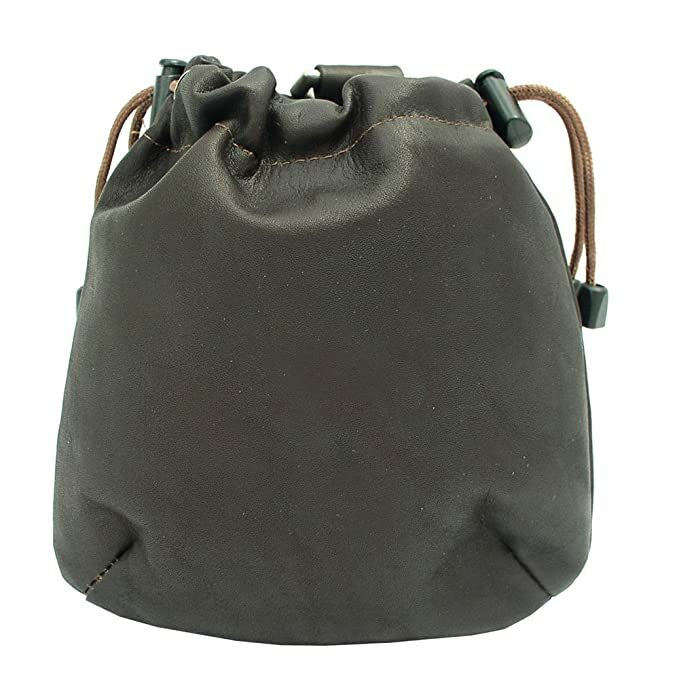 A leather pouch to carry 4 decks o’ yer pirate vessel cards and a smaller pouch to carry ye gamin’ dice. 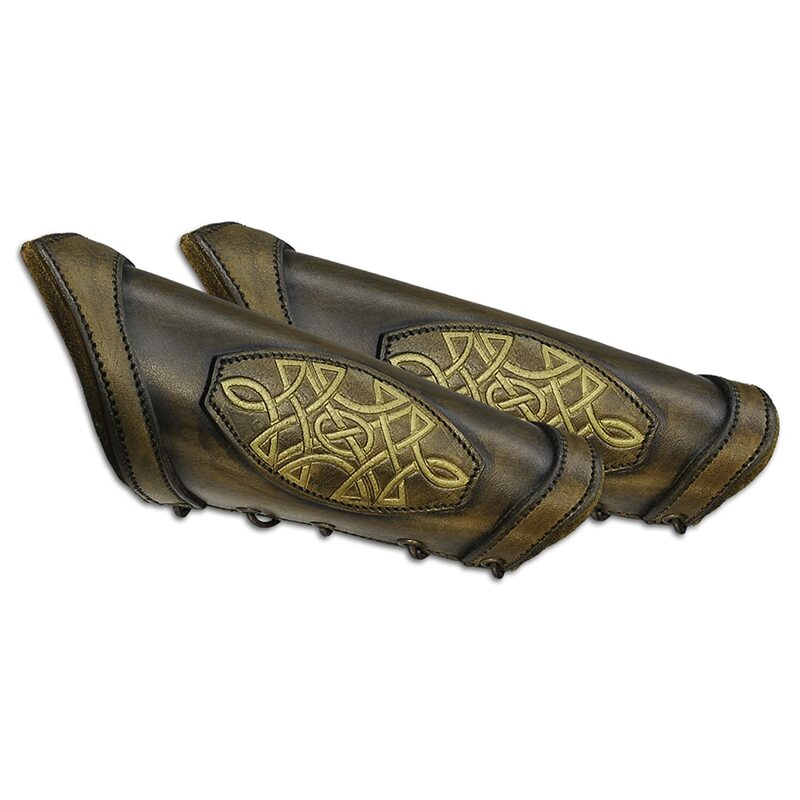 A nice gamin’ set to make ye a bit o’ extra cash whilst in port or out at sea. 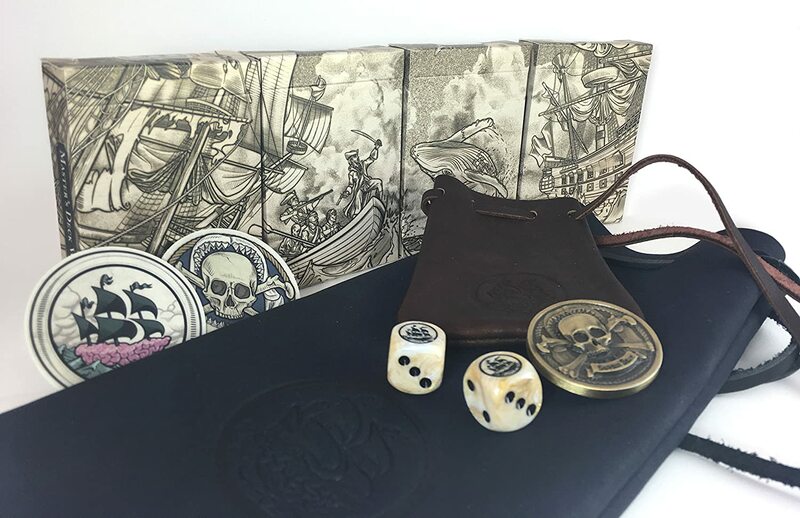 Decks are printed with pirate motif on the inside cards and an epic sea battle on the outside. 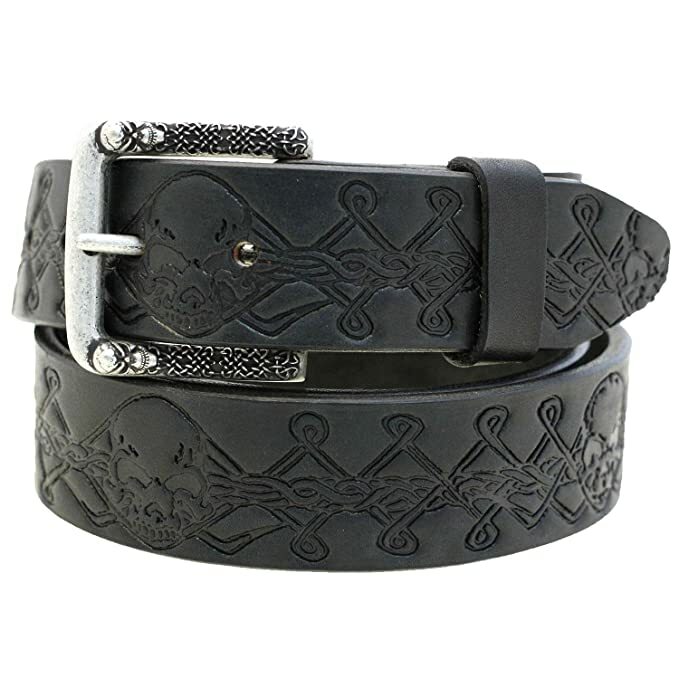 The leather pirate patches are available in the brilliant colors and styles featured below. 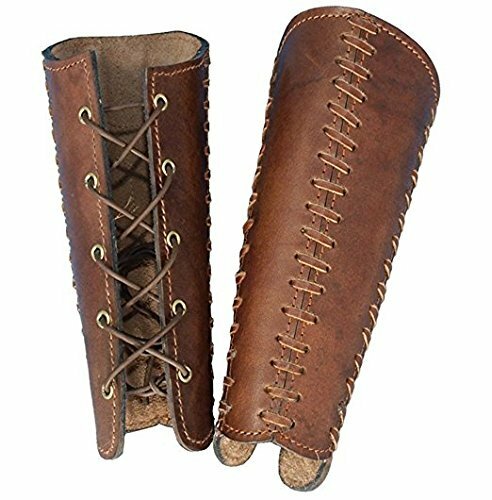 They are all handcrafted of premium, high-quality leather in the USA. 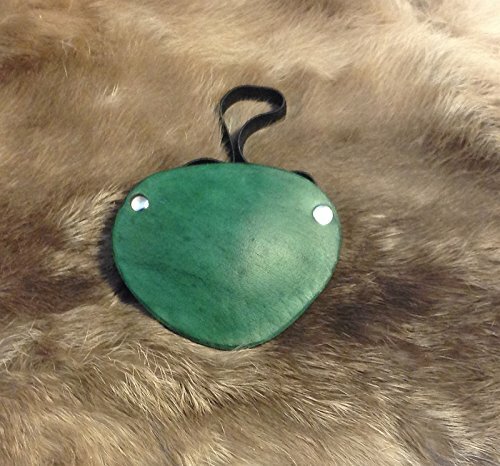 They are all hand tooled and hand dyed. 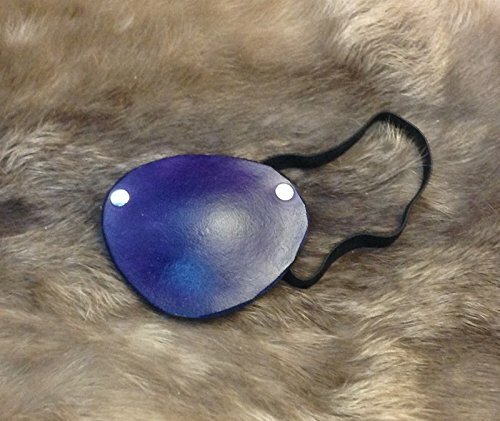 These are premium leather eye patches at bargain prices for all your costume needs. 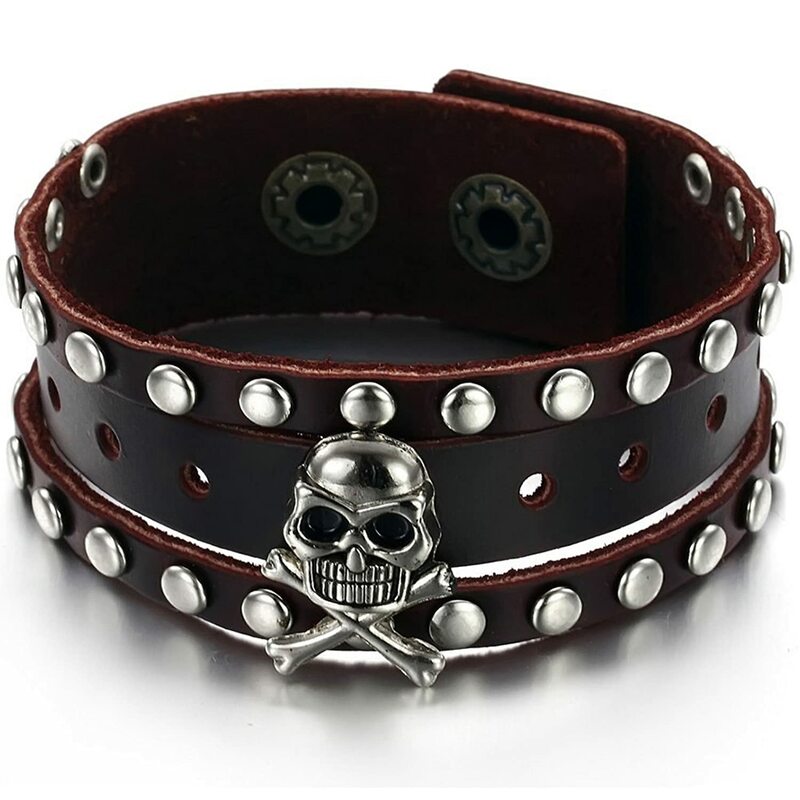 Argh Matey! 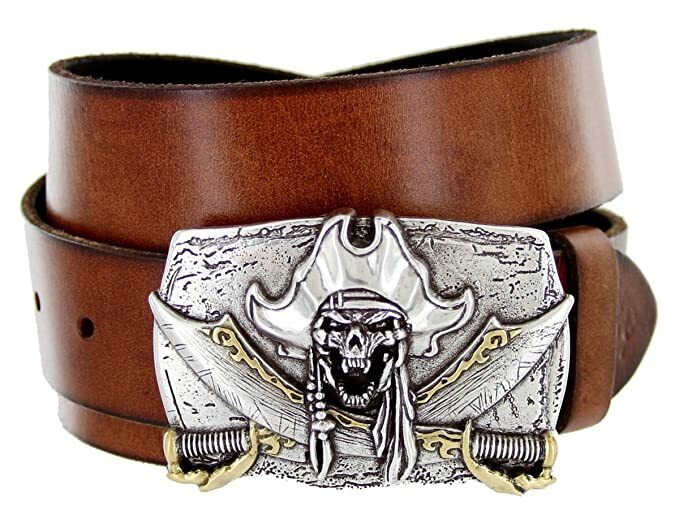 I have high hopes ye found just the perfect pirate leather accessories ye be lookin’ fer to add to yer pirate gear. 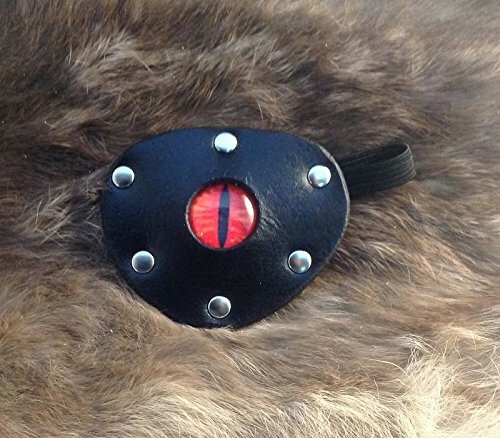 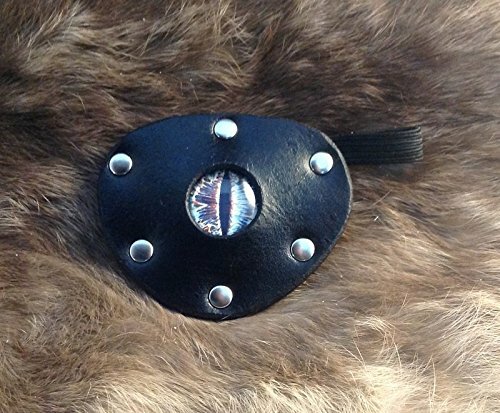 If ye still be a-lookin’ you may want to check out our Men’s Medieval and Renaissance Leather Accessories page by clicking this link here. 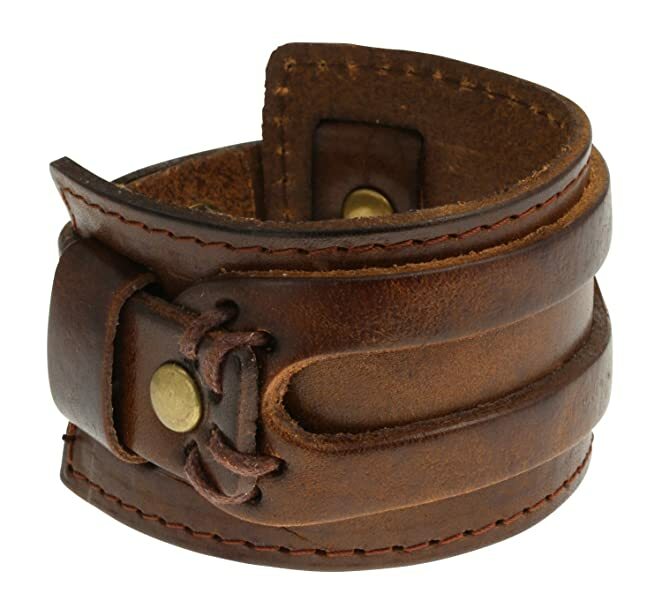 And shiver me timbers I hope ye have a fine day sailing the oceans blue while enjoyin’ a tankard of ale.